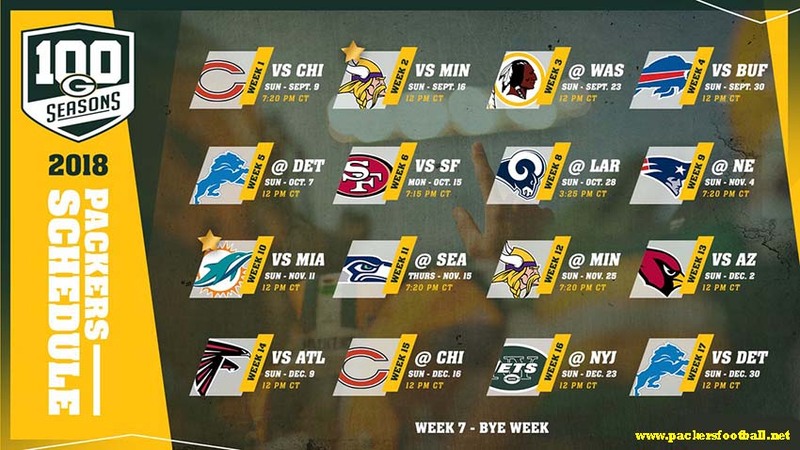 The Packers’ 2018 schedule goes through the NFC West and AFC East, and that is part of Green Bay’s path in trying to get back to the top of the NFC North. The good news for the Packers as they examine their 2018 schedule is Aaron Rodgers is back, and Green Bay has won the division five out of 10 seasons since he took over as starting quarterback. Minnesota has won the division the last two seasons, and the Vikings are one of four playoff teams on the Packers’ schedule this season. Atlanta visits Lambeau Field, too, and Green Bay has road matchups against New England and the Los Angeles Rams. Below is a breakdown of the Packers’ schedule in 2018. The Packers are a team with a lot of upside with the offense a strong bet to bounce back with Rodgers and a schedule, that while not easy, is certainly navigable. Green Bay dropped from eighth in total offense in 2016 to 26th last year. That showcases the importance of having a reliable quarterback under center, especially one as good as the two-time NFL MVP and six-time Pro Bowl selection. Rodgers leading an aerial attack that also features Graham, Davante Adams, Randall Cobb and Geronimo Allison has the potential to post monster numbers. And what the running game lacks in star power, it should make up for in versatility. Exactly how good the Packers can be will depend on improvement defensively, which is far less certain than the offensive rebound. Green Bay ranked 22nd in total defense and 26th in scoring defense last season. It added defensive end Muhammad Wilkerson and brought back cornerbacker Tramon Williams for a second stint with the club, but the unit will also need internal development to succeed. All told, the Packers should be playoff contenders based on their offense alone. They’ll need better play on defense to become a serious Super Bowl threat, though. Toughest tests: Road games against the Seahawks and Patriots won’t be easy; Green Bay has lost the last three trips to Seattle, starting with the infamous “Fail Mary” game. It’s worth noting that Rodgers has never started a game at Gillette Stadium. The Packers also travel to the West Coast to face a beefed-up Rams team in what could be one of the most entraining games of the season. Biggest breaks: The Packers avoid a trip to Atlanta, where the Falcons have scorched them three times in the last two seasons. The home schedule is very friendly. Keep in mind Green Bay finished 4-4 at home last season, and that included a 3-0 record with Rodgers. Copyright © 2019 Packers Football. Powered by WordPress. Designed by myThem.es.